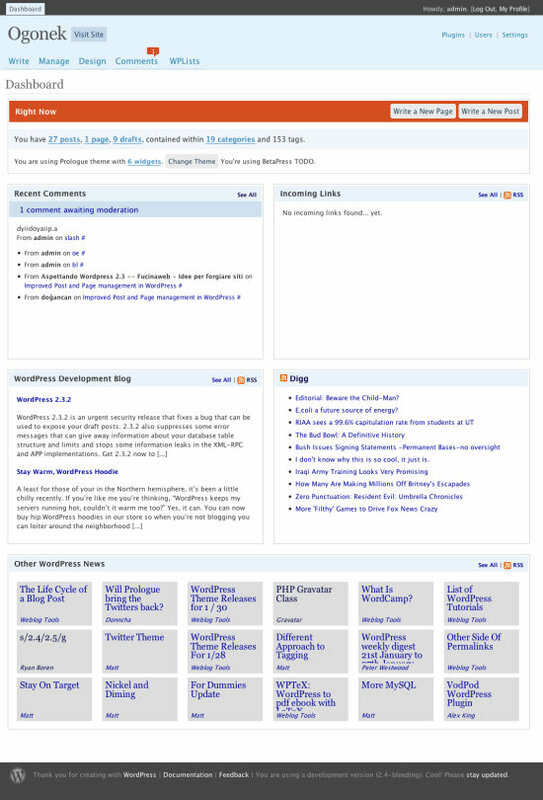 On a WordPress IRC channel, Michael Adams of Automattic posted this this screenshot of the new design for the new WordPress Dashboard. The Dashboard is the first page you see when you log in to the WordPress administrative area. As you can see, the Dashboard will be divided into blocks, and those blocks are widgets, meaning that you can display any of your regular WordPress sidebar widgets in the Dashboard. In the screenshot, for example, Adams uses the RSS widget to show links from Digg. This kind of flexibility and extensibility is exactly what the Dashboard needs. For too long, it’s been a place for people to skip over on their way to doing the work of blogging (in previous versions, the lead developers’ personal blog posts tiled up most of the page). Posted in Releases | Tagged , Dashboard | Bookmark the permalink. Follow any comments here with the RSS feed for this post. Post a comment or leave a trackback: Trackback URL.